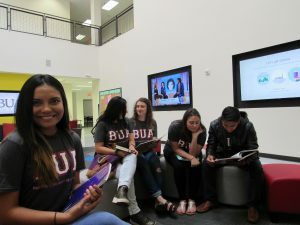 “The world is at our doorstep; it is here at BUA,” said Mary Ranjel, director of Admissions/International Student Services at Baptist University of the Américas. BUA is recognized for its cross-cultural environment and emphasis. This semester, 36 percent of the student body is comprised of international students, representing 20 countries across five continents. Valentina Sanchez, a Sophomore from Ibague, Colombia, recognizes that, like herself, every student that comes to BUA is a miracle, a testimony of God’s faithfulness. When she was 13 years old, Valentina started dreaming of studying another language and serving on the mission field. Throughout high school, she dedicated hours to researching institutions around the world and praying about her dream. High achieving students in Colombia who pass a state exam receive a full-ride scholarship to any university in the country. Valentina passed the exam. Feeling perplexed about what decision to make, she continued seeking God. Her parents gave her their blessing to study abroad, if she could find an affordable, Christian university. Her search lead her to BUA. Valentina is a double major in Human Behavior and Theology. She also feels a call to pursue social work and missions. She is being equipped at BUA through her studies and extracurricular involvement in Baptist Student Ministries and missions. Valentina pictured with fellow students in the Maciel Student Union at BUA. She was one of six students who served as missionaries in Texas this summer, leading VBS at eight churches and one summer camp. Half the team was comprised of international students. “When I see what they are doing in their churches and ministries, I am amazed by the impact that these students are making in our world today,” said Ranjel, tearing up. BUA students are changing neighborhoods in Texas and beyond. Many international students continue their studies after finishing at BUA. Others serve in churches or return to their home countries, where they often receive good jobs because of their marketable skills and English language acumen. Regardless of where students are from or where they go, each student is welcomed to the BUA family. You can invest in the next generation of cross-cultural, Christian leaders like Valentina by giving to BUA here. If you are interested in visiting the campus, please come to BUA Day.